Hanoi (VNA) – Hanoi’s agricultural sector has faced many challenges due to climate change and a reduction in agricultural land. 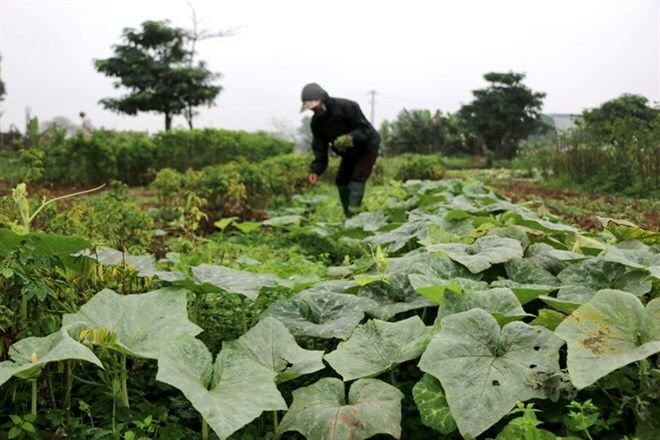 In Chuong My district’s Nam Phuong Tien commune, about 20 ha of vegetables have been planted this season, but prolonged torrential rains and hot weather recently severely damaged the vegetables, said Chairman of the commune People’s Committee Nguyen Chien Thang. Dang Huu Hung, a local farmer, said he was worried about his pomelo garden after the historically hot weather hit the city in June, the time his pomelo trees were about to blossom. He said he was deeply concerned about his pomelo crop this year. In Dan Phuong district’s Ha Mo commune, dozens of hectares of flowers were also affected by hot weather and prolonged torrential rains, Ha Noi Moi (New Hanoi) newspaper reported. Nguyen Dang Tien, a lily grower said he earned hundreds of millions of dong from his lily field in previous years. But this year, there was no profit. Head of the Cultivation Office under the Hanoi Agriculture and Rural Development Nguyen Thi Thoa said besides the weather, the city’s cultivation sector also suffered from a reduction in agricultural land due to rapid urbanisation. Data from the department found that there 2,550 ha of agricultural land in the city was lost since this spring crop season due to urbanisation, she added. Minister of Agriculture and Rural Development Nguyen Xuan Cuong, said local agencies should closely watch weather forecasts to issue warnings to local farmers about the right time to plant. This would help minimise damages on crops caused by weather, he said. For example, farmers should be advised to plant their flowers every 5-7 days instead of planting them all at the same time. This method will protect them from losing all their flowers due to bad weather, he said. Additionally, the local agricultural sector was told to carefully select rice seedlings for higher productivity in the context of urbanisation reducing farm land, he said. Hanoi should use hi-tech technology to develop its agricultural sector, he said. Agreeing with Cuong, Do Duc Trung, Vice Chairman of the People’s Committee of Hoai Duc district said hi-tech agriculture was believed to be the best choice to help farmers adapt to climate change. The district applies hi-tech to 55ha of vegetables in Tien Yen commune. It has also encouraged local farmers to apply hi-tech in growing Canh orange and Dien pomelo in the future, he said. Statistics from the agricultural department showed that the city has run 38 hi-tech agriculture models. Thanks to the models, famers could earn between 400 million VND (17,600 USD) and billions of dong per ha each harvest season.